As we know I’ve been on the search for a perfect foundation. Something that has everything I like; medium to full coverage, a spot on color match, matte finish, and long lasting. I thought I had found this when I purchased Revlon ColorStay Whipped, but I was wrong. If you didn’t read my review on that, I’ll link it here. I picked up L’oréal Infallible Pro-Matte Foundation as a part of my major haul. I’ve been wearing it for a while now and I am absolutely in love. First of all, this color match is perfect for my winter skin. That’s the first thing I love about it. Second, it actually lasts all day, I never see any blemish peek through. I also love the fact that it’s a matte finish but it doesn’t make me look cake-y or dry. My favorite thing about the foundation is that it’s the perfect medium to full coverage for me. You really don’t need to use much product to cover your full face, I use a little more than a pea size amount and blend it with my beauty blender and I’m always happy with the results. I haven’t tried applying it with a brush yet, but I don’t really use brushes to apply my foundation anymore. I have normal skin, but I have read reviews that this works amazing for people with oily skin. As far as dry skin, I’m not entirely sure. The texture is different it’s like a mix between a mousse and a liquid in my opinion, but I love it. I bought mine at Walgreens and it was $12.99. Judging how little I use, I’m sure this will last me quite sometime. I honestly believe I’ve found my go-to foundation! That doesn’t mean I won’t be trying others, though! Along with the Infallible line came a setting spray which I haven’t tried just yet, but you best believe I’m going to! One thing I found that I’m not too fond of with this foundation is the appearance of my pores. It could be the primer I’m using, plus the fact my pores are just giving me grief right now. I’m definitely going to try using Benefit’s POREfessional with this and see how that helps! 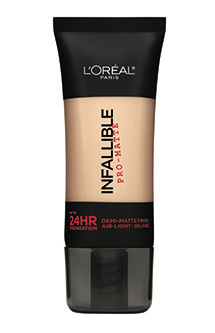 What are your thoughts on L’oréal Infallible? Have you tried it yet? We've all heard them before, our mothers taught us, our aunts warned us, and our grandmothers led the way. The Modern Lady's Guide is bringing the old rules up-to-date. Because let's face it, if we can update our phones, hair-styles, and wardrobes, we better be able to update our rule book. So go grab a beer, and get to reading. This entry was posted in Uncategorized and tagged base, beauty blog, benefit, benefit cosmetics, Blog, comment, cosmetic review, follow, foundation, foundation review, infallible, loreal, loreal infallible review, make up reveiw, makeup, makeup blog, matte foundation, porefessional, primer, Review, reviews, setting spray, small blog, suggestions, The Modern Lady's Guide, TheModernLady. Bookmark the permalink.